Children provide many challenges in clinical dentistry and behaviour management. All dental care provided for a child should consider the characteristics of that individual such as age, behavioural capabilities and ‘total treatment load’. 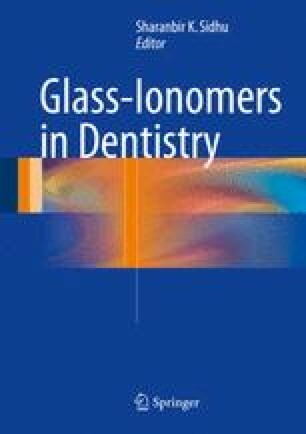 Especially in the child at high risk of dental caries, the use of low-viscosity glass-ionomer cements (GICs) in timely protection of ‘at-risk’ surfaces of molar teeth is of great benefit. The selection of an appropriate restorative material can be influenced by the caries risk, age to exfoliation of the primary tooth, size and position of the carious lesion, pulpal status and other factors such as appearance. GICs are the primary material of choice for the cementation of preformed metal crowns and are also useful in sealing over pulpotomy agents to maintain seal and pulpal health. The use of GIC in orthodontics, especially in those individuals with increased caries risk, is advisable. Whether used as a band or bracket cement, GIC decreases the risk and extent of white spot lesion formation around orthodontic fixtures, and if applied accordingly, bond strengths are high enough to undertake orthodontic care efficiently.